Washing vegetables can be a dirty job that produces a tough to treat waste stream of soil particles, vegetable debris and nutrients such as nitrogen and phosphorus. In many cases, farms must treat water to restore clarity and remove nutrients before discharge to a receiving body. This is typically done using settling ponds, but for farmers in Ontario’s Holland Marsh, the soil is fine-textured and peat-like with low specific gravity that does not readily settle in conventional treatment ponds. Bishop Water was invited by the Holland Marsh Growers’ Association (HMGA) to assist in developing a simple, affordable solution for washwater treatment after the group learned about the company’s success and experience in agricultural applications. Prior to this, the HMGA was experimenting with another type of non-woven fabric filter bags, but the bags were experiencing clogs, ruptures and poor solids retention — they were unable to reduce TSS to an acceptable level. Bishop Water installed a pilot system of its Solids Handling Solution. In this case, two 25-foot (7.6-metre) Geotube® containers were set up near the farm’s settling pond. Washwater was pumped at a rate of 350L (92.5 US gallons) per minute, treated with polymer to aggregate the small soil particles and then directed to the Geotube® containers. Once inside, solids remained trapped, while clean filtrate trickled out through the tiny pores of the Geotube® container. 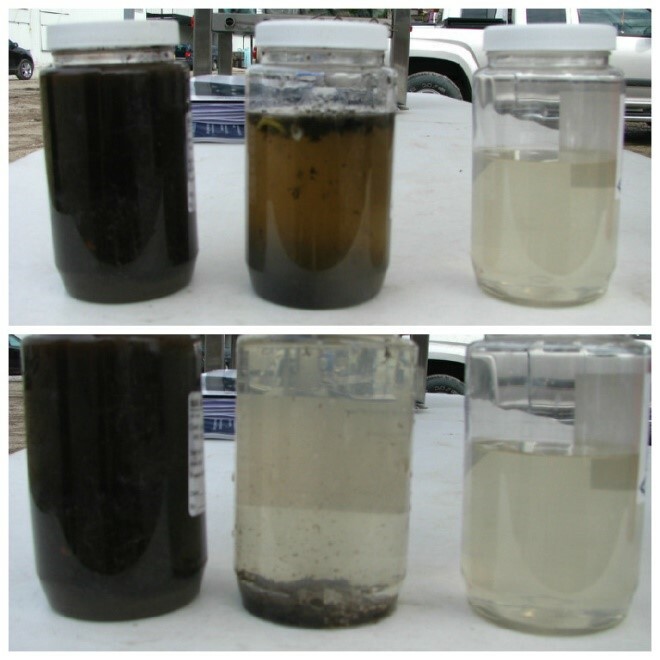 The reduction in TSS averaged about 91%, with significant reductions in nitrogen and phosphorus also achieved. A report of the pilot project, issued by the HMGA, stated that Geotube® dewatering is a viable option to treat vegetable was and flume water. A Geotube® solution provides a much more reliable method to capture the organic muck and achieve major reductions in solids and nutrients that are entering receiving bodies. Once full, a Geotube® container can be cut open and the soil inside can be reclaimed for continued agricultural use.